Libby Black ‘Self Help’, ‘Andy Warhol Book’ and ‘Workout Room’ installation. Images courtesy of Libby Black. Wednesday, March 11th, 7:00 pm – Artist Lecture Series: Libby Black, at Mills College: Libby Black, a dedicated adjunct professor at California College of the Arts, is a prolific painter and installation artist. Her work is based on imagery culled from disparate sources like fashion magazines, snapshots, newspapers, pop culture websites, television, movies and still lifes that she has staged. She is interested in having the work chart a path through her personal history and a broader cultural context to explore themes of impermanence and identity. Black received a BFA in Painting from the Cleveland Institute of Art and an MFA in Painting from the California College of the Arts. Located in the Danforth Lecture Hall, 5000 MacArthur Blvd, Oakland. This lecture is free and open to the public. 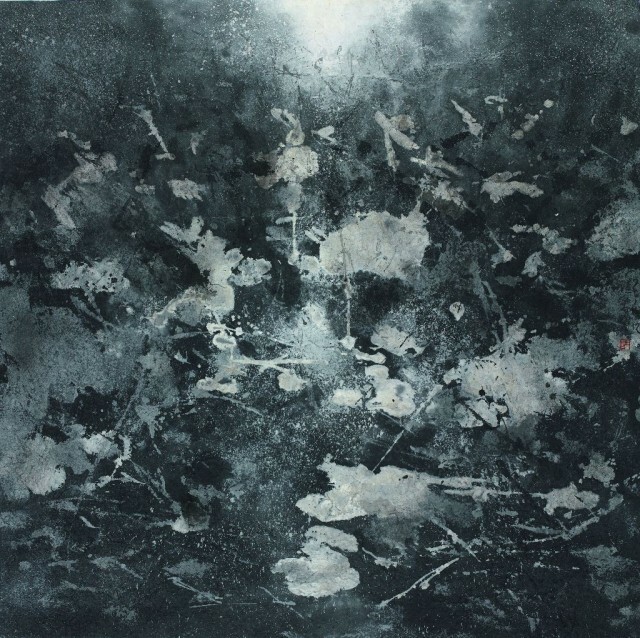 Lu Chuntao, ‘Lotus Pond’ 2014, ink on handmade paper. Courtesy of The Visual Art Center at The Chinese Culture Foundation. Saturday March 7th, 1-3pm – Mind Traveling: Ink Art of Lu Chuntao, at The Chinese Culture Foundation’s Visual Art Center: Curated by University of California, San Diego Professor of Asian Art History, Theory and Criticism, Kuiyi Shen, this is the first US solo exhibition for artist Lu Chuntao. The exhibition of nearly 30 works features new ink on handmade paper paintings, in addition to several past works representative of Lu’s distinctive style, and is the first in a series of activities celebrating the Chinese Culture Foundation’s 50 year anniversary and annual Spring Festival. The exhibition also launches the Visual Art Center’s 2015 program series, Without Walls, aimed at engaging the broader community in the arts, both at the Center and in public spaces. The Visual Art Center, located at 750 Kearny Street, 3rd Floor, will host an opening reception for the artist on March 7th, from 1:00-3:00 PM. The exhibit is open through April 11, 2015. Images from last year’s art auction, courtesy of Southern Exposure. Saturday, March 21, 6:00 pm – EQUILUX, Southern Exposure’s Art Auction Fundraiser: Southern Exposure (SoEx) is an artist-centered non-profit organization committed to supporting visual artists. Through extensive and innovative programming, SoEx strives to experiment, collaborate and further educate. Their annual art auction fundraiser features work by over 100 incredible artists, food and cocktails and artist-led experiences. One day after the vernal equinox, this event is equal parts night and day, a celebration of celestial alignment and the beginning of a new season. VIP and main event tickets are available here. Doug Hall, installation view of ‘The Terrible Uncertainty of the Thing Described’. Image courtesy of Doug Hall. Saturday, March 28th, 6:00 pm – Doug Hall: The Terrible Uncertainty of the Thing Described at the San Francisco Art Institute: SFAI and SFMOMA are pleased to jointly present Doug Hall’s seminal large-scale installation The Terrible Uncertainty of the Thing Described (1987), which conjoins industrial imagery with documentary scenes of nature in turmoil. Its three channels of video, displayed on six monitors and a projection, are accompanied by the sculptural presence of a functioning Tesla coil, two large steel chairs, and a tilted, commanding steel-mesh barricade. Bringing together the immediacy of sculpture with powerful moving images, and startling jolts extending from the coil, the installation is a potent reminder that we are subject to the forces of nature and the influence of media. The opening reception is at 6:00 pm in the Walter and McBean Galleries, 800 Chestnut Street.